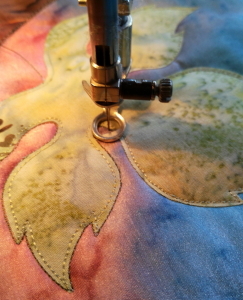 August Challenge Week 3 » What's Under the Needle? This week I'm going to try to use 'shadow' as my word. What will you use? If you are yet to get started, go back to week 1 to find out what it is all about. Here's a link back to it: Part 1. 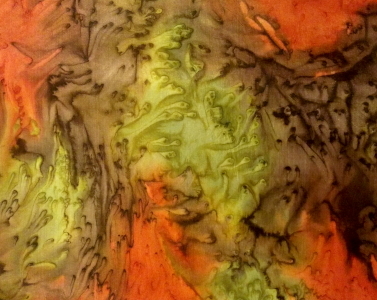 I found another piece of silk that I thought I could include in my design. I'm making this up as I go so like me, feel free to dip back into your stash again. The initial fabric selection is basically just a place to get started. You don't have to use them all and you can add more as you work along. I love how the rock salt makes such interesting movement in the colors! ...but ended up scrapping that idea. The fun thing about creating, you can change your mind and it is fun to see where your thoughts lead you. 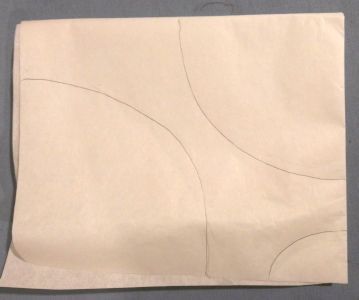 Instead of the frame idea, I folded the fusible into quarters and drew some curves. This reminded me of those paper doll chains we used to make as kids! 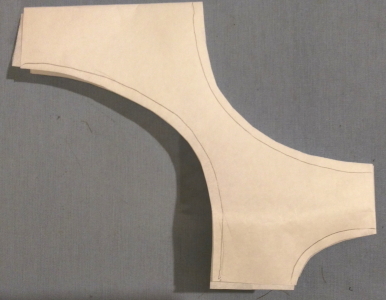 I cut out each curve, leaving a little extra so that once it was fused onto the fabric I'd be making a nice crisp cut through both fabric and fusible together along the line. The shadow on the ironing board as I was taking this photo, gave me an idea. 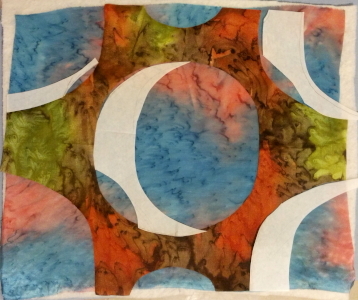 The curves were quite interesting when I unfolded the fusible so I pressed it onto the silk and cut it out. Here it is sitting over the background. 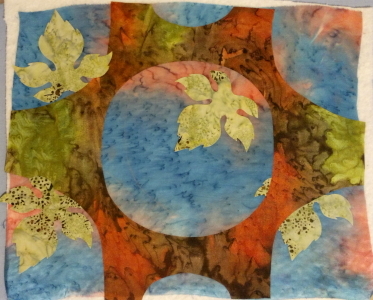 I played around with the leaves, popping them in between the two layers. 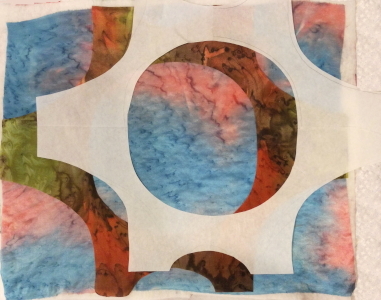 After playing a while, I realized I had better think a little harder about my word this week 'shadow' so using the backing paper from the fusible, I got an idea of where the top fabric might cast a shadow on the background. With an idea in mind, I used that backing paper to cut out the shapes so I could get a better sense of the finished idea. The backing paper cut-outs also gave me templates to use later. So that's enough playing, it is time to press down the fabrics to make them permanent.... 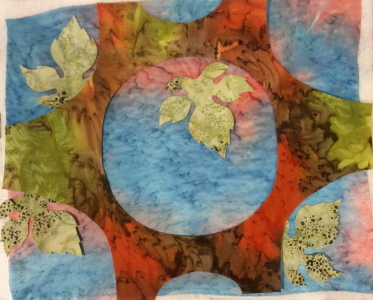 I tipped some of the leaf sections above the top layer and some below for added interest - notice the two leaves on the left how one section extends over the top fabric while the next is under. 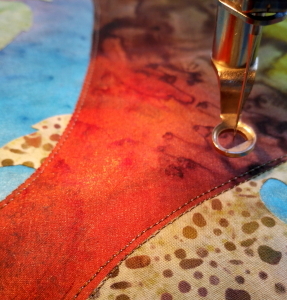 Time to begin stitching - this is my favorite part! 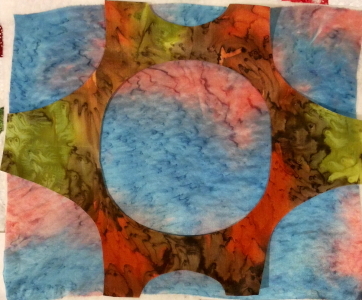 I started with the main section and free motioned around it twice using a dark olive green rayon thread. Then once around the leaves using a matching thread. 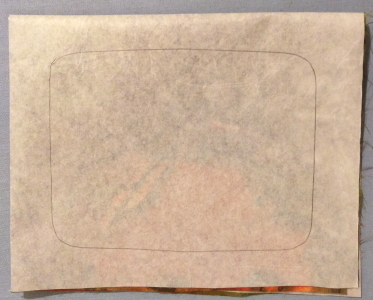 Lastly, I used the paper templates to stitch in the shadows. I do plan to do more to these shadows but haven't decided exactly what yet. Perhaps I just need some time to think about it... How did you get on? Hi Ruth, I also tried to add a shadow this week. 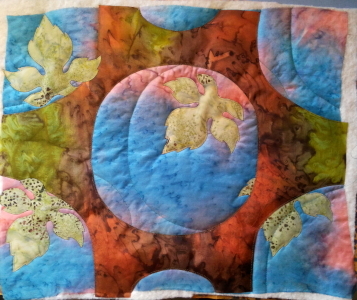 In my quilt I have a pear, and tried to create a shadow under the pear!